I liked the trial shirt from the moment I saw it. All neatly pressed and arranged, the cardboard collar finishing in a tab at the front that declared ‘By Royal Appointment’. A nice touch, as was the label (black, discreet, reading ‘Turnbull & Asser Bespoke’) and the bag (also black, with the same bespoke message, but a little less discreet). This was the trial version of my first bespoke shirt (as previously described on this site, here). The idea is that you wear it three times and wash it as you would your normal shirts, so you can try the fit and so the guys at Turnbull & Asser can see how much you are likely to shrink your shirts over time. You then have a fitting with the worn and laundered shirt, before the final measurements are sent to factory. When I tried the shirt on, I was pleased with the cloth – a Sea Island-quality cotton in white. The tail was impressively long (no scrimping there). And I liked the higher collar that had been suggested because of my relatively long neck. While not being as large as some fashion-led shirts of the past few years, the extra height was still noticeable and flattering. It also fastened with just the one button – having two or more is unnecessary, even for very high collars. However, I was rather concerned with how big the shirt felt everywhere else. I could get four fingers under the collar (it should be more like two); the gap between the sides of the collar seemed rather large; the sleeves seemed to be slipping far below the base of my thumb; and the waist and hips felt rather bulky. It also felt like there should be one more button at the bottom of the placket – when the shirt rode up it seemed to gape and expose my mid-riff. Little changed after three washes (one of them at 60 degrees, to be on the safe side). But then I don’t tumble dry my shirts, which is a big culprit in the shrinking of shirts. 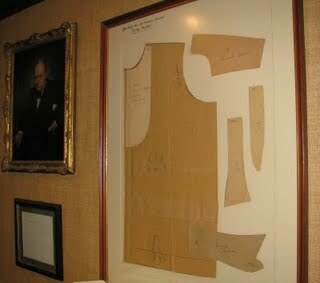 When I went back for my fitting, master shirtmaker David Gale was very reassuring. He repeated his previous message that it is always worth making a shirt big as it can’t be enlarged, only cut down. So we took 3/8 of an inch out of the collar and made the cuffs each ¼ of an inch smaller. We also reduced the gap between the ends of the collar, the presumption being that one would wear a bigger tie knot with a spread collar like this. I don’t. Finally, we cut down the chest, waist and hips – originally the excess here had been 5, 4 and 4 (inches); that was reduced to 3.5, 1 and 3. I’m sure this will fit well, but I did wonder why the trial shirt itself was not closer to the mark. I also asked for one extra button to be added to the bottom of the placket. The shirt and the new, adjusted pattern will now be sent to the factory. The next instalment in this series will be a visit to the factory to watch my shirt being made. You can follow the discussion on First British bespoke shirt 2 by entering your email address in the box below. You will then receive an email every time a new comment is added. These will also contain a link to a page where you can stop the alerts, and remove all of your related data from the site. This has been a great series, can’t wait to see the next installment. Turnbull & Asser does great work from what I can see, and this whole fit shirt thing is a pretty cool idea. Very instructive and interesting Blog. Thanks for that! Regarding T&A shirts I have to admit that I much preferred their old tags, not so obnoxiously black. But fortunately one can ask for the tags to be left out – which is what I do.